Welcome to the Friends of the Library store! 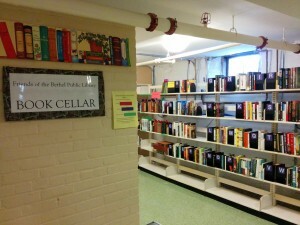 The Book Cellar is located in the basement of the Seelye House, where the Teen Services section used to be. It carries gently-used books, vintage books, CDs, DVDs, Records, and some fun surprises in the “like new” section. If you’re interested in volunteering to help in The Book Cellar, please Contact the Friends.